Making it look easy, camping near Easy Pass. A waterfall along Happy Creek Trail provides a great place to take break and chat up the ranger. 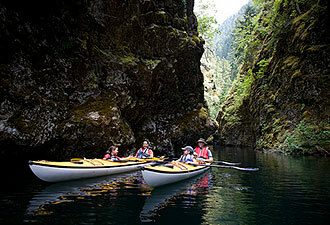 Kayaking on Ross Lake: does it get any better than this? 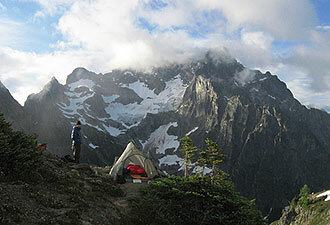 The North Cascades are calling! A short two hour drive northeast of Seattle you'll find a national park of extreme diversity … and extremely good fun. The mountains of North Cascades National Park Complex rise from nearly sea level to over 9,000 feet. Nestled between the peaks you'll find 312 glaciers, the largest concentration outside of Alaska and home to 1/3 of all glaciers in the lower 48. With almost 400 miles of trails and over 130 backcountry campsites, the park is a prime venue for backpackers, canoeists, and mountaineers to explore a northwest wilderness. The North Cascades are also a wonderful place for families of all sizes – and outdoor skill levels – to enjoy. 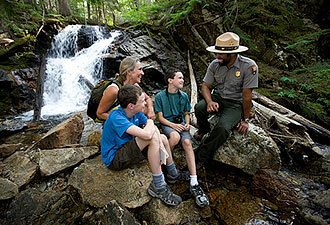 Campgrounds are a perfect base camp for day hikes, water recreation, and Ranger programs at the nearby visitor center. If you've got kids, pick up one of the park's brand new Junior Ranger booklets at any of the six information centers. Packed with stuff that kids and families can do together while they explore the park, a completed booklet will get you sworn in as an official Junior Ranger and earn a badge and patch. An easy first visit to North Cascades National Park Complex can start at one of the Free Adventure Days at the Environmental Learning Center on Diablo Lake. You can follow a park ranger on a ramble through mossy woods to a hidden waterfall or join a North Cascades Institute instructor for a paddle on the emerald-green lake. Want more of an adventure and family time too? Come to one of the Family Getaway Weekends also at the Environmental Learning Center. Enjoy comfortable accommodations in cozy lodges and wonderful meals at the lakeside dining hall, cooked with the tastes of young eaters in mind. Kids and adults can have fun doing everything from arts and crafts to storytelling to scientific explorations. There's also plenty of free time to play on the lake and trails at your own pace. Need a real escape from city life? Take a leisurely ferry ride up Lake Chelan to the remote community of Stehekin. Once you reach Stehekin, accessible only by boat, foot, or float plane, climb aboard one of the park's brand new red buses and head for Rainbow Falls while a ranger interprets the history of the Stehekin Valley. The buses also shuttle visitors to trailheads where you can hike for the day or begin an overnight trip into the wild heart of the North Cascades.